SCOTTSDALE, Ariz. – Dec. 12, 2017 – Barrett-Jackson is lining up an impressive docket of Chevrolets representing the history of the American automaker’s most celebrated and powerful cars for the 47th Annual Scottsdale Auction, January 13-21, 2018, at WestWorld of Scottsdale. 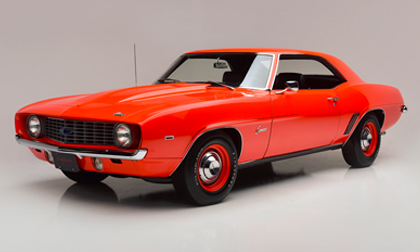 Spanning the generations, the Scottsdale Chevrolet docket will include a highly coveted range of models, including Lot #1409, #59 of the 69 COPO 9560 high-performance 1969 Camaros and Lot #1291, Body #1 and VIN 002 of the ’57 Chevrolet 150 series sedan. Among the Chevrolets bringing their history and horsepower to the Scottsdale Auction is #59 of the 69 COPO 9560 high-performance Camaros (Lot #1409) built in 1969. Finished in Hugger Orange with an all-aluminum 427ci engine under the hood, this Camaro is the only ZL1 ordered with a NC8 chambered exhaust. Corvettes will also highlight the docket, including a rare ’65 Corvette Stingray Cutaway (Lot #1413), which was used as an auto show display to demonstrate all of the hidden mechanical components of the car. Also set to cross the block is an award-winning 1968 Corvette L88 (Lot #1418) finished in Le Mans Blue, powered by a factory L88 427/430hp engine.